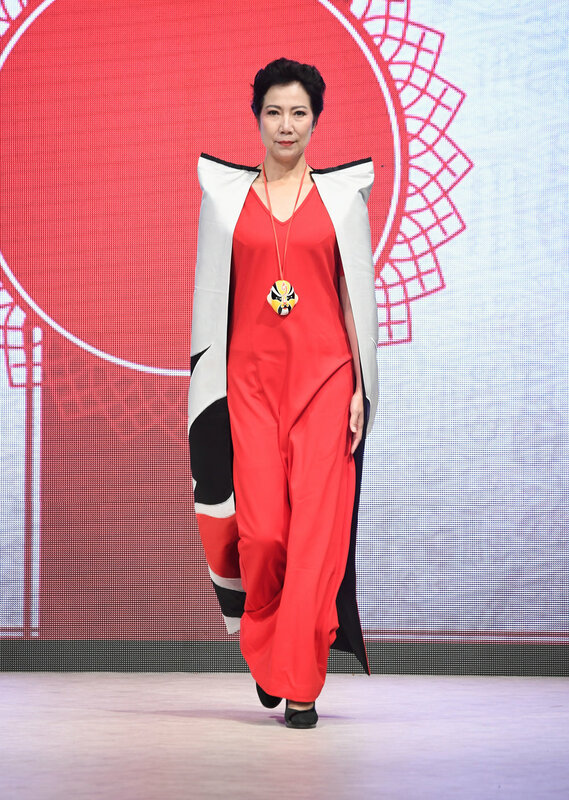 Sunday, September 23rd, 2018 – Vancouver, BC – VFW closed the week with an extraordinary line-up of local and international designers. Alex S Yu opened the final day of shows with ‘The Abnormal Symmetry’ collection. Featuring a plethora of navy and white stripes, denim, asymmetrical hemming and peplum detail, the Canadian based label expertly played with proportions, patchwork, and layering. 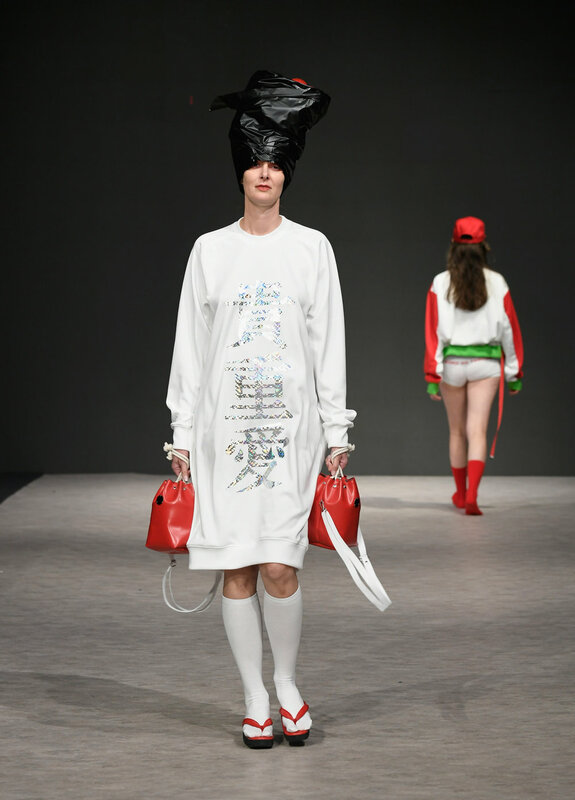 Canadian designer Evan Clayton took the runway by storm with his eccentric collection, ‘Ego’. Placing the main focus on branded underwear sets, models clad in crotchless slick patent trousers, skin-tight bodysuits, sheer kimonos, and glossy plastic breastplates delighted the audience. With help from drag queen trio Gia Metric, Jane Smoker, and Kendall Gender, and his initials garishly glittered across most of the collection, the designer no doubt left a lasting impression. For SS19, Jessica Tierney for Chained Couture presented her NYC inspired collection, ‘CHAINED’. The Australian designer’s all black line featured shoulder padded duster coats held together by metal loops and chains, oversized silver belts, satin flared pants, and faux fur shawls, leaving a gothic atmosphere hanging over the runway. JPK channelled the streets with a collection of monochrome and futuristic multipurpose clothing. Based in the UK, Jan-Philipp Kosfeld presented a unisex line built for core functionality with concealed pockets in oversized metallic blazers, PVC duster coats adaptable to changing weather, and pre-crinkled trousers. With muted colour palettes and corn-rowed models, the collection achieved its goal of interlacing timeless elegance with Hip-Hop culture. 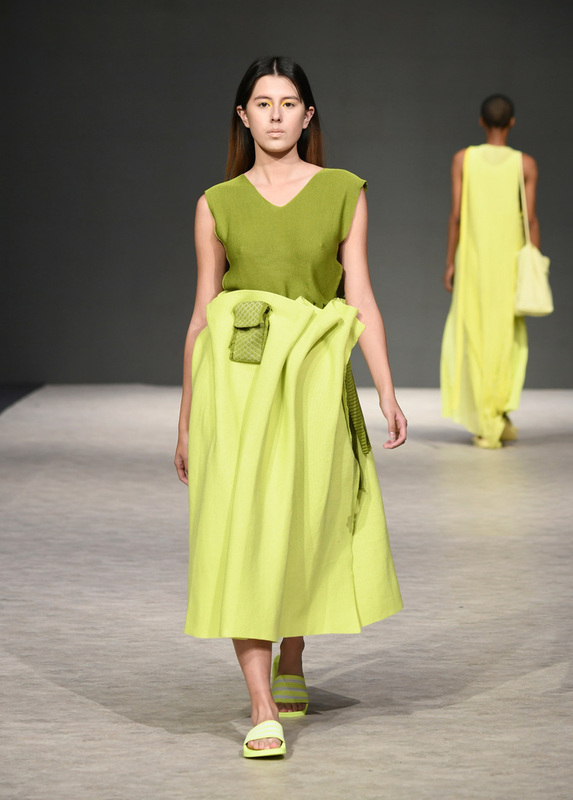 Shades of yellow from Canary to Lemon shone through collection ‘Jaune’ by German designer Annika Klaas, winner of the European Fashion Award FASH 2018. With a focus on knitwear processes and seamless technology, collage-like outfits created a deconstructed feel. With colour graded layers and see-through structures, the knitted fabrics emphasized experiments in textures. Beautiful colours in dreamy soft knits made the crowd swoon.